Build a Windows install server...using Linux! Open-source network restore and boot. Monitor anything, not just system parameters. 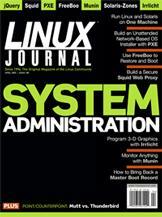 Run Linux and Solaris on the same machine. 3-D graphics programming—not just for geniuses anymore!